Growing tired of thinking what to serve every night? How about trying our weekly selection boxes which provide you with all you need for 14 fantastic meals !! Our Selection boxes are only £29.99 each which is an incredible £2.14 per meal so are excellent value for money! Each box contains a wide variety of Willetts top quality produce from which you can create a whole host of great meals. There are seven different boxes to choose from and they include firm favourites such as steaks and lamb chops as well as diced chicken for stir–frys and pies and minced beef for lasagne and cottage pie so there is something for everyone ! And don’t forget they can be delivered direct to your door, free of charge, during our local delivery round! Please contact us for details. 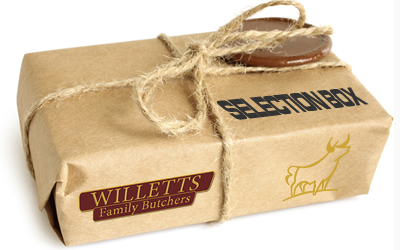 In addition, there is our Student Selection box which is a great way of sending them off to University with easy to cook meals such as sausages, burgers and fresh curry sauces and knowing they will still be eating Willetts fantastic produce! And don’t forget, we also have 8 Barbecue Selection Boxes to ensure your next BBQ is definitely a winner ! We know that with such a great selection of meats for the BBQ, it’s not always an easy choice so we have done it for you ! We have a range of 8 Barbecue Selection Boxes to suit all tastes and budgets which include all your favourite handmade sausages, burgers and kebabs. They are a great way of catering for your next BBQ !